It's a Huge Week for Blu-rays, Everybody! Get ready to empty your wallets, gang, because it's a huge day for releases. 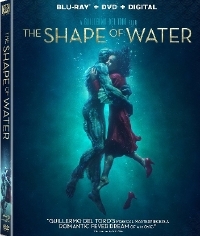 First up is Guillermo del Toro's Academy Award winning The Shape of Water. Yes, it a romance-with-no-borders yarn, but also a love letter to horror and the movies. Check it out if you can. Onwards to all the great releases this week! After the experimental outings of There's Always Vanilla and Season of the Witch, Night of the Living Dead director George A. Romero returned to rather more distinct horror territory with his 1973 infection opus The Crazies. Starring cult icon Lynn Lowry (Shivers, I Drink Your Blood), the influence of Romero s The Crazies can be felt in everything from the director s own subsequent work many commentators have noted the stylistic and thematic similarities to his zombie classic Dawn of the Dead right up to Danny Boyle's 28 Days Later and beyond. Sorry Snyder fans, no director's cut here. SUSPIRIA - remastered in a Spectacular 4K Restoration! Dario Argento's SUSPIRIA comes to home video from Synapse Films in an exclusive new 4K restoration from the original uncut, uncensored 35mm Italian camera negative with the original 4.0 English surround sound mix, for the first time EVER! Painstakingly restored over the past three years, Synapse Films has created the ultimate special edition of this horror classic with the supervision and approval of the film(s Director of Photography, Luciano Tovoli. Though Harding was the first American woman to complete a triple axel in competition, her legacy was forever defined by her association with an infamous and poorly executed attack on fellow Olympic competitor Nancy Kerrigan. Featuring an iconic turn by Margot Robbie as the fiery Harding, Sebastian Stan, Allison Janney, and an original screenplay by Steven Rogers, Craig Gillespie's I, Tonya is an absurd, irreverent, and piercing portrayal of Harding's life and career in all of its unchecked—and checkered—glory. It’s the summer of 1983 in Italy, and Elio (Chalamet), a precocious 17-year-old, spends his days in his family’s villa transcribing and playing classical music, reading and flirting with his friend Marzia. One day, Oliver (Hammer), a charming American scholar arrives as the annual summer intern tasked with helping Elio’s father, an eminent professor. Elio and Oliver discover the heady beauty of awakening desire over the course of a summer that will alter their lives forever. The Disaster Artist is the hysterical comedy based on "The Greatest Bad Movie of All Time" (THE ROOM). History Channels latest scripted series is an action-packed scripted series chronicling the stories of the Knights Templar and their quest to find the Holy Grail. One year after finding vengeance for his murdered brother, MMA champion Kurt Sloane finds himself back in Thailand kidnapped and imprisoned there by a powerful gangster (Christopher Lambert). His only shot at freedom is to win an underground death match against a 400lb killer enhanced with state-of the-art drugs (Game of Thrones' Hafþór Júlíus Björnsson) . To make it out alive, he seeks training unlike anything he s ever endured, with the help of the legendary Master Durand (Jean-Claude Van Damme) and fellow prisoner Briggs (Mike Tyson).